This is micronized white powder which produces a matting effect in the film when it is mixed with different varnishes. The introduction of this additive into the varnish produces surface micro-roughness which reflects diffuse light and this produces gloss decreasing. But the final results also depends on the light absorption properties of the layers applied beforehand, consequently the optical effect can be different in different systems. 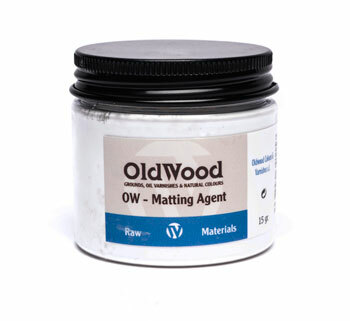 OW Matting Agent must be incorporated into the last layer of varnish (maximum in the last two layers if applied by hand).